This is an apt title for a book that has been developing – egg by egg – for the past twenty years. 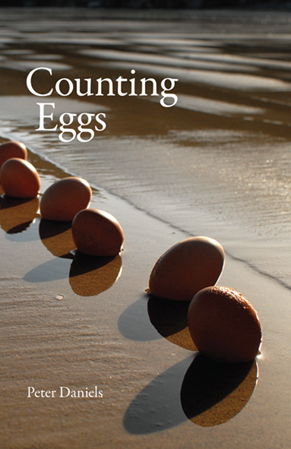 Peter Daniels’ first collection includes poems that have featured in five previous pamphlets and won several major awards including the Arvon Competition. At 55 poems, it’s a big collection, but the different lines of thought that inevitably arise from sampling the full breadth of a poet’s work do, in Daniels’ case, thread together cohesively to form a book that sustains an anxious assessment of everyday living, in all its modernity and minutiae. For instance, ‘The Jar’ looks at our denial of nature in the way we live. I enjoyed the visceral shock of the new pot of raspberry jam containing ‘something / brown and alive with legs’ as well as the image of the hideous ‘blue’ creatures found drowned in a water pail in ‘Mice’. In dramatising the speaker’s desperate attempt to ignore them, to ‘keep the lid down on the water’, Daniels reminds us that we can’t control nature, that it is always present at the margins, creeping inevitably ‘across our rug’ (‘Insects’). It is this sharp awareness of the condition of being ‘civilised’, of our contrivance to live closed off from nature in a very human world, that lends an importance to the most interesting poems in the book, those centred around London. Daniels tunes into a collective experience of buses and tubes, the ‘walk to the station’ (‘Endeavours’), a glimpse of St. Paul’s – that suggests a specifically urban, inward-looking bubble, a sense of blinkered routine, like the buses that ‘drive the blood along our veins, carry us home’ (‘Routemasters’). ‘Endeavours’ is perfectly poised between a wise awareness of the need to continue living and working by the ‘book of experience’, fitting with the status quo, and a wary realisation that this kind of life is in some way limited, that ‘we hold it together between stations, between dreams’. ‘City Boy’ feels especially pertinent for our time, in its depiction of lives codified by capitalism: ‘I felt how this money / is part of us, and keeps ourselves within it’. These poems work because they awaken our insecurities about the structures governing the world that we are forced to buy into. Daniels also takes us away from London and pans his sharp eye across a series of foreign locations. These poems are like a traveller’s idiosyncratic photographs requiring special explanation: a San Francisco fire station, a soldier in a bar in Palermo, a display about mammoths in a Minneapolis mall. Daniels shows us the human stories in the corners of these scenes – ‘the men / idly shooting hoops’ (‘The Fireyard’) – and maintains a sense of the wide-eyed traveller gazing round at the new culture in which he finds himself, catching strange and visual moments: a woman in a red skirt holding up the traffic as she licks ‘a deep strawberry ice-cream’. The poems are at their most effective with a sharply-observed character or place at their centre, and I found I was less convinced by some of the work in the latter half of the book which reached for mystical themes, the images succumbing to a kind of fable-like vagueness of fountains and forest pools, phrases like ‘when the time is full’ (‘Done’)… Where elsewhere it succeeds, here perhaps the work suffers a little from Daniels’ extremely light touch, his style so direct and transparent it is almost prosaic. But for an unnerving tour of the modern landscape we all share, I recommend this full and varied collection from an experienced poet. Phoebe Power is an Eric Gregory winning poet. - It is irrational to desire immortality? - Could a belief in immortality affect an individual’s character? - Would an afterlife existence be boring or monotonous? - Does death provide a meaning to life? - Can we learn about the meaning of life from pondering about immortality?